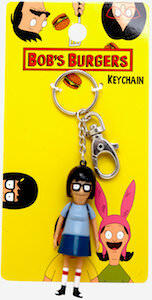 If Tina is you favorite Belcher family member then you just need this Bob’s Burgers Tina key chain. The key chain has a key loop and a little clip and then on a little chain you find Tina herself and she is just what you expect in her dark blue skirt and light blue top. So now you can carry your keys in your pocket while Tina Belcher is watching them for you. Now you can have a Bob’s Burgers character with you where ever you go and if you don’t like Tina on your keys then why no use her as a charm on your backpack or maybe even as a zipper pull for you jacket.